The B-17 Flying Fortress heavy bomber from World War II. A bomber is a military aircraft designed to attack ground and sea targets, by dropping bombs on them, firing torpedoes at them, or – in recent years – by launching cruise missiles at them. A Tupolev Tu-160 strategic bomber. Strategic bombing is done by heavy bombers primarily designed for long-range bombing missions against strategic targets such as supply bases, bridges, factories, shipyards, and cities themselves, in order to diminish an enemy's ability to wage war by limiting access to resources through crippling infrastructure or reducing industrial output. Current examples include the strategic nuclear-armed strategic bombers: B-2 Spirit, B-52 Stratofortress, Tupolev Tu-95 'Bear', Tupolev Tu-22M 'Backfire'; historically notable examples are the: Gotha G.IV, Avro Lancaster, Heinkel He-111, Junkers Ju 88, Boeing B-17 Flying Fortress, Consolidated B-24 Liberator, Boeing B-29 Superfortress, and Tupolev Tu-16 'Badger'. Tactical bombing, aimed at countering enemy military activity and in supporting offensive operations, is typically assigned to smaller aircraft operating at shorter ranges, typically near the troops on the ground or against enemy shipping. This role is filled by tactical bomber class, which crosses and blurs with various other aircraft categories: light bombers, medium bombers, dive bombers, interdictors, fighter-bombers, attack aircraft, multirole combat aircraft, and others. Current examples: F-15E Strike Eagle, F/A-18 Hornet, Sukhoi Su-27, Xian JH-7, Dassault-Breguet Mirage 2000, and the Panavia Tornado; historical examples: Ilyushin Il-2 Shturmovik, Junkers Ju 87 Stuka, Republic P-47 Thunderbolt, Hawker Typhoon, McDonnell-Douglas F-4 Phantom II and Mikoyan MiG-27. British Handley Page Type O, 1918. The first use of an air-dropped bomb (actually a hand grenade) was carried out by the Italians, by Lieutenant Giulio Gavotti, during the 1911 Italo-Turkish war in Libya. While mainly used as a trainer, Avro 504s were briefly used as bombers at the start of the First World War by the Royal Naval Air Service (RNAS) when they were used for raids on the German airship sheds. The Caproni Ca 1 was a twin-boom trimotor biplane that first saw action in 1915, when one was used to attack the Austrian air base at Aisovizza. The Sikorsky Ilya Muromets, became the first four-engine bomber to equip a dedicated strategic bombing unit during World War I. This heavy bomber was unrivaled in the early stages of the war, as the Central Powers had no comparable aircraft until much later. When the war started, bombing was very crude (hand-held bombs were thrown over the side) yet by the end of the war long-range bombers equipped with complex mechanical bombing computers were being built, designed to carry large loads to destroy enemy industrial targets. Arguably the most important bombers used in WWI were the French Breguet 14, British de Havilland DH-4, German Albatros C.III and Russian Sikorsky Ilya Muromets. Long range bombing raids were carried out at night by multi-engined biplanes such as the Gotha G.IV (whose name was synonymous with all multi-engine German bombers) and later the Handley Page Type O; the majority of bombing was done by single-engined biplanes with one or two crew-members flying short distances to attack enemy lines and immediate hinterland. As the effectiveness of a bomber was dependent on the weight and accuracy of its bombload, ever larger bombers were developed starting in WWI, while considerable money was spent developing suitable bombsights. 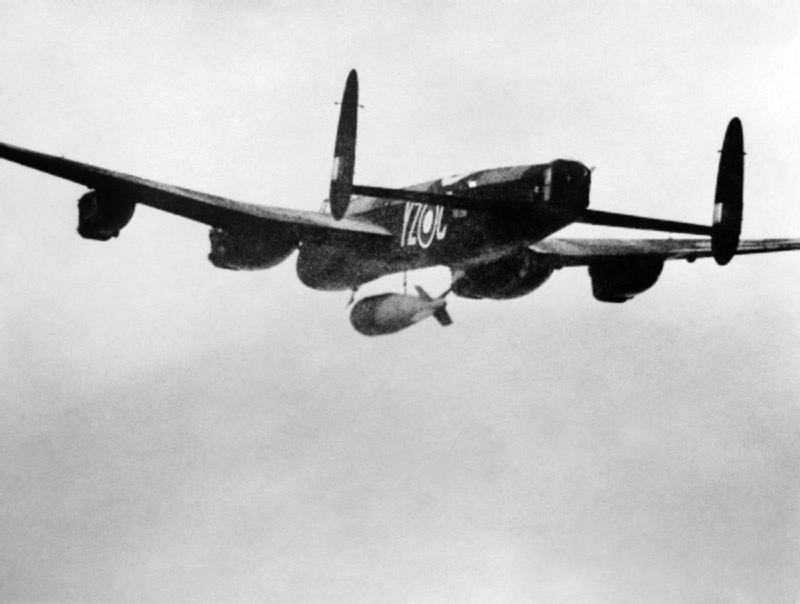 Avro Lancaster with a 22,000 pounds (10,000 kg) Grand Slam bomb, 1945.
dive bomber - specially strengthened for vertical diving attacks for greater accuracy. light bomber, medium bomber and heavy bomber - subjective definitions based on size. torpedo bomber - specialized aircraft armed with torpedoes. ground attack aircraft - aircraft used against targets on a battlefield such as troop or tank concentrations. A further specialized form was the anti-tank aircraft. night bomber - specially equipped to operate at night when opposing defences are limited. maritime patrol - long range bombers that were used against enemy shipping, particularly submarines. Some smaller designs have been used as the basis for night fighters, and a number of fighters, such as the Hawker Hurricane were used as ground attack aircraft, replacing earlier conventional light bombers that proved unable to defend themselves while carrying a useful bombload. At the start of the Cold War, bombers were the only means of carrying nuclear weapons to enemy targets, and had the role of deterrence. With the advent of guided air to air missiles, bombers needed to avoid interception. High speed and high altitude flying became a means of evading detection and attack. Designs such as the English Electric Canberra could fly faster or higher than contemporary fighters. When surface to air missiles became capable of hitting high flying bombers, bombers were flown at low altitudes to evade radar detection and interception. Once "stand off" nuclear weapon designs were developed, bombers did not need to pass over the target to make an attack; they could fire and turn away to escape the blast. Nuclear strike aircraft were generally finished in bare metal or anti-flash white to minimize absorption of thermal radiation from the flash of a nuclear explosion. The need to drop conventional bombs remained in conflicts with non-nuclear powers, such as the Vietnam War or Malayan Emergency. The development of large strategic bombers stagnated in the later part of the Cold War because of spiraling costs and the development of the Intercontinental ballistic missile (ICBM) – which was felt to have similar deterrent value while being impossible to intercept. Because of this, the United States Air Force XB-70 Valkyrie program was cancelled in the early 1960s; the later B-1B Lancer and B-2 Spirit aircraft entered service only after protracted political and development problems. Their high cost meant that few were built and the 1950s-designed B-52s remained in use into the 21st century. Similarly, the Soviet Union used the intermediate-range Tu-22M 'Backfire'in the 1970s, but their Mach 3 bomber project stalled. The Mach 2 Tu-160 'Blackjack' was built only in tiny numbers, leaving the 1950s Tupolev Tu-16 and Tu-95 'Bear' heavy bombers to continue being used into the 21st century. The British strategic bombing force largely came to an end when the V bomber force was phased out; the last of which left service in 1983. The French Mirage IV bomber version was retired in 1996, although the Mirage 2000N and the Rafale have taken on this role. The only other nation that fields strategic bombing forces is the People's Republic of China, which has a number of Xian H-6s. Transferring a 2,000 pound Joint Direct Attack Munition (JDAM) to a lift truck for loading onto a B-1B Lancer supersonic strategic bomber in Southwest Asia in 2007. Plans in the U.S. and Russia for successors to the current strategic bomber force remain only paper projects, and political and funding pressures suggest that they are likely to remain so for the foreseeable future. In the U.S., current plans call for the existing USAF bomber fleet to remain in service until the mid-to-late 2020s, with the first possible replacements becoming operational in 2018. After this bomber the U.S. is also thinking of another bomber in 2037. The 2018 bomber will be made in small quantities as it will be a transition aircraft for this 2037 bomber. The 2018 bomber was, however, required to provide an answer to the fifth generation defense systems (such as SA-21 Growlers, bistatic radar and Active Electronically Scanned Array radar). Also, it was chosen to be able to stand against rising superpowers and other countries with semi-advanced military capability. Finally, a third reason was long-term air support for areas with a low threat level (Iraq, Afghanistan). The latter was referred to as close air support for the global war on terror (CAS for GWOT). The 2018 bomber would thus be able to stay for extended periods on a same location (called persistence). ↑ Johnston, Alan (10 May 2011). "Libya 1911: How an Italian pilot began the air war era". BBC News. http://www.bbc.co.uk/news/world-europe-13294524. Retrieved 2011-05-23. ↑ "USAF may seek supersonic and unmanned capabilities for bomber". http://www.janes.com/news/defence/air/jdw/jdw071018_1_n.shtml. Retrieved 2007-11-25.